Remember when we did fizzing fireworks back in July and volcano egg dying back in April? Both activities involved using vinegar and baking soda and were amazingly fun. Today's post is my absolute favorite one yet... mostly because both of my kids were fascinated by this fizzle painting activity for over thirty minutes... several times today. In toddler time... that is like hours and hours! I think I had just as much fun as they did watching them explore and creating myself! Fizzle Painting (the way that we use it in this post) was introduced to me by my son's preschool director. 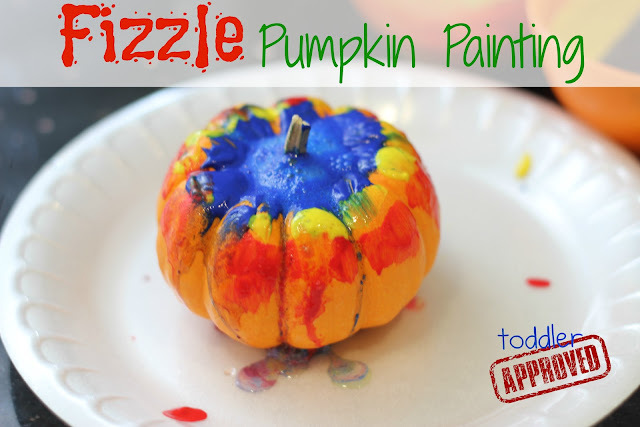 I have seen several fizzing sidewalk paint posts that are similar on Pinterest too... but I haven't seen any using our current favorite object- the pumpkin. Fizzle painting involves using a baking soda paint mixture and then squirting vinegar onto the paint to create a reaction. It is awesome! Materials Needed: pumpkins, paintbrushes, baking soda, vinegar, tempura paint, bowls, a spoon, a surface to paint on, and an eye dropper (or straw... which is what we used). Mix your paint with baking soda in bowls. I separated each color. Use three parts baking soda to every one part of tempura paint... so your paint should have a lot of baking soda in it... but still be liquidy enough to paint onto a surface. You don't want it to be clumpy or powdery. 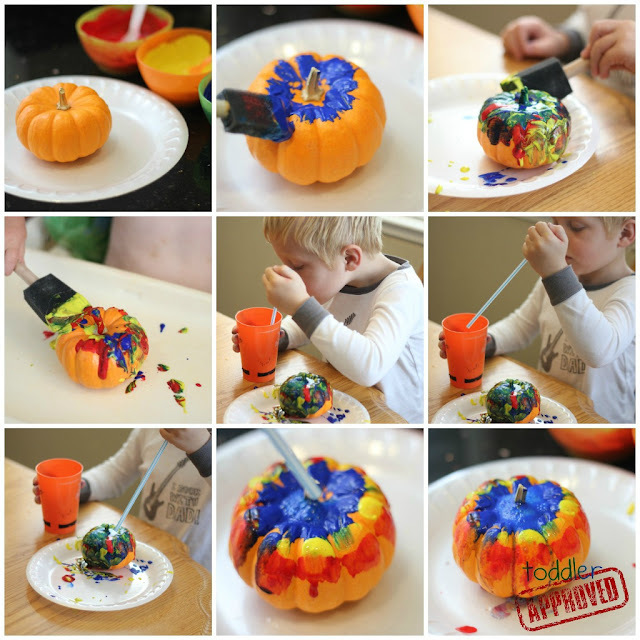 Cover your pumpkin with lots of colorful paint!! The more the better! Once the pumpkin is painted, use an eye dropper (or straw) to transfer some vinegar from a bowl and squirt it onto your pumpkin. The paint should fizzle and bubble where you squirt the vinegar as it reacts with the baking soda paint. My son got so excited every time he made the paint fizzle (or sizzle) and my daughter exclaimed, "bubbles!!" Add more paint to your pumpkin and then squirt on some more vinegar. Once your pumpkin is sufficiently covered with paint and vinegar and it stops fizzling, you can move it to another surface to dry and then add more paint on your plate and do more fizzle painting there (without the pumpkin)! Or grab another pumpkin and start over again! My kids each painted three to four pumpkins today using this technique and then a friend came over this afternoon and we painted even more pumpkins! 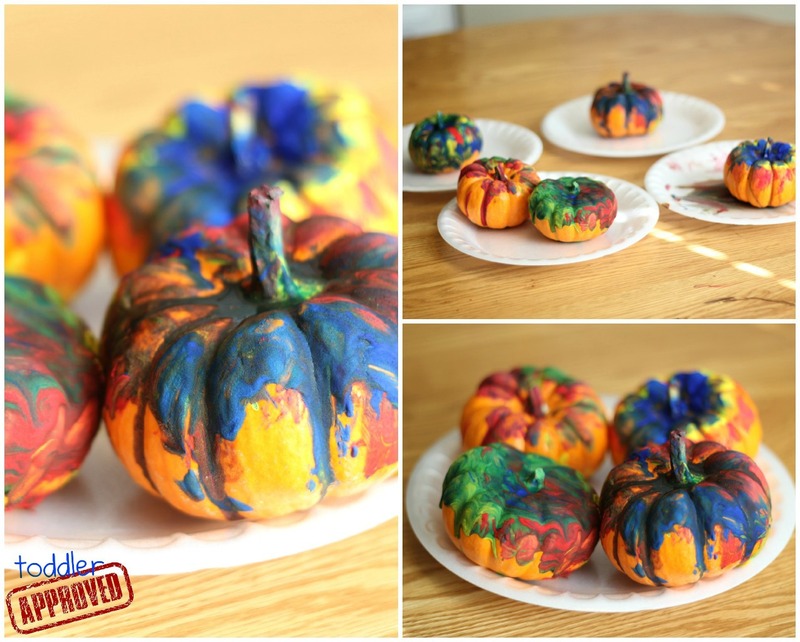 I loved how the painted pumpkins looked once they were dry as well! Have you ever done fizzle painting? Do you call it something different? What other surfaces could you paint on? Do you have any other favorite baking soda/vinegar activities? We are always looking for more! If you missed Monday's post, make sure to enter our awesome Annual BabbaBox Membership and $250 Target Gift Card Giveaway! Click here to sign up and find out more details. 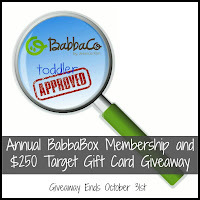 Giveaway expires on October 31st so don't wait to enter! Ohh how much fun some science painting :) I've never done it and it's something that now I want to try out. These look so pretty. My guy would love that the paint fizzles. What a great project! They turned out great and what sun they must have been! can u do this with home made paint? I am not sure! I only tried with tempera. Why don't you try it and let us know? It can be your own science experiment. To be honest I don't think the paint makes too much of a difference... though some paints crack when they are put on pumpkins. But the reaction between the baking soda and vinegar will still happen whether you use tempera or something else. I love it! I have to do something like this with my girls! This looks really fun...can't wait to try with my own little ones! Super cool idea! Especially on pumpkins for Halloween! Can't wait to try it!